General admission tickets to the 5th Anniversary edition of Rhizome's Seven on Seven program, returning to the New Museum on May 3, are sold out. Missed your chance to buy tickets? Live somewhere other than New York City? Worry not—you can still join this celebration of art and tech. Everyone, anywhere: we'll be live-streaming the entire event via the front page of rhizome.org, 12-6pm EST on May 3. Don't miss artists Kari Altmann, Ian Cheng, Simon Denny, Holly Herndon, Kevin McCoy, Hannah Sawtell, and Frances Stark, and technologists Nick Bilton, Anil Dash, Jen Fong-Adwent, David Kravitz, Aza Raskin, Kate Ray and Rus Yusupov. (All bios available on Rhizome's Seven on Seven microsite). Microsoft Research's Kate Crawford will give the day's keynote address. Also follow us on Twitter; we'll be using #7x7NYC for discussion about the event. Londoners: The White Building will host a full weekend of events in conjunction with this 5th Anniversary. On May 3rd, they will live-stream the full program as a public event, and on Sunday, May 4, they'll host a critical forum on the state of art and technology collaboration. 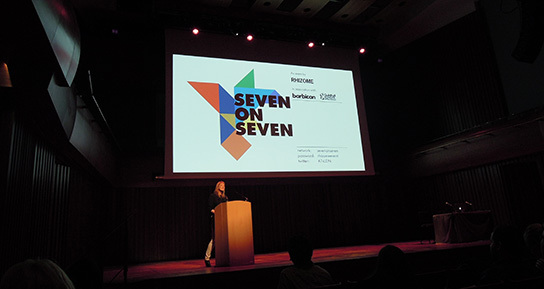 Throughout both days, they'll house a mini-exhibition of highlights from five years of Seven on Seven. New Yorkers: While the event is sold out, we're still offering tickets for the after-party. Join the participants and audience, and the party host committee—comprising Lauren Cornell, Nick Chirls, Alex Chung, Matt Duckor, Audrey Gelman, Sarah Hromack, Julia Kaganskiy, Thessaly La Force, Jill Magid, Hari Nef, Megan Newcome, Slava, and Anthony Volodkin—in the New Museum's Sky Room as we toast the day's work and this program's five years.